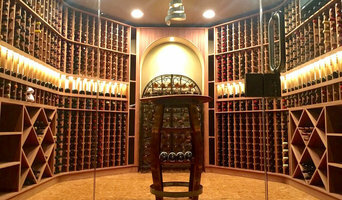 Cory Lamp of Lamp Wine Cellars is recognized in the greater St. Louis area as an expert in the custom design, manufacture and installation of quality wine racks and wine storage systems for both residential and commercial users. Just like the building of your wine collection, building a custom wine cellar is a very personal process. Cory’s custom-designed cellars are handcrafted to match your design desires and bottle capacity needs. Exceptional design and expert craftsmanship are an important part of fine wine storage, but keeping the quality of your wine the same as the day it was bottled is equally as important. Correct room preparation and temperature control are crucial to the proper aging of your wine, and Lamp Wine Cellars will help guide you through the steps and decisions that will result in the wine cellar of your dreams, while avoiding costly mistakes. Lamp Wine Cellars is experienced in working with contractors and home builders, and the ideal time to contact Lamp Wine Cellars for a no-obligation consultation is when framing is complete, but prior to roughing in. However, if you are already working with a contractor or builder, Lamp Wine Cellars will work directly with them to provide the racking systems. Lamp Wine Cellars provides design creativity, the highest quality materials and craftsmanship, and unsurpassed customer service. 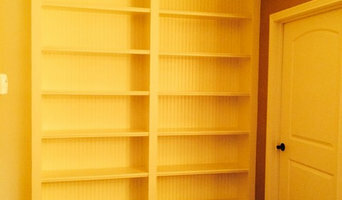 Let them help you create a customized wine cellar that is uniquely yours and perfectly fits your needs. Reclaim Renew is a sustainable, custom reclaimed wood furniture creator for homeowners that want to complete their space with something special, something exceptional, something with a story. We transform living spaces into gathering places by creating beautiful, timeless reclaimed wood furniture pieces from local barn wood that reflect your unique style and personality. Most of our furniture is created from the wood of 100-year-old barns and is custom-designed to suit your home or office needs. While your guests will surely admire it, you’ll enjoy how it reflects your personality even more. Each nail, knothole, scratch and imperfection of the reclaimed lumber material adds to the character of each piece, making your reclaimed furniture the focal point of any room and a timeless investment you’ll cherish for a lifetime. And much like the memories you’ll make in your home, your furniture is guaranteed to be one of a kind. Reclaim Renew is under new ownership and no longer owned by Reclaim Renew, LLC. Kraft Boys, LLC is the new owner of the Reclaim Renew brand. KDR Designer Showrooms represents the pinnacle of style, service and design for luxury home interiors. With locations in St. Louis, Kansas City and Minneapolis, KDR delivers the world of interiors to the doorsteps of designers, architects and homeowners. Keeping your standards and style in mind, we’ve carefully selected a collection of lines, ranging from renowned, iconic brands, to small, artisan-run companies where, to our delight, the owner still answers the phone when we call. As a design professional, or a homeowner with a keen eye and enthusiasm to match, your passion for interiors is one that we share. Our sales associates are eager to help with every step of the process, from selection and sampling to shipping. Representing over 150 lines, we have the furniture, fabric, window coverings and drapery hardware you’re searching for—it’s your vision, and it’s our pleasure. Let us know how we can help. With over 25 years of combined expertise, our professional team of interior designers and consultants offers clients a broad range of services for model homes, private residences, and commercial spaces. Only the highest quality and most tastefully designed furnishings and accessories are selected for our showroom. Our exclusive merchandise is chosen and purchased in limited quantities to ensure its uniqueness. Be sure to visit frequently, in person or on our website, to see what's new at Ooh La La! Express Blinds & Draperies is St. Louis' Premier Hunter Douglas Showcase Dealer. Our ability to create the perfect window treatments for your home or office is unmatched. Our Window Treatment Specialist combines design skills with craftsmanship and installation expertise to provide exceptional and affordable solutions for all your window treatment needs. "The mission of an interior designer is to put together the client's vision, piece by piece, like a puzzle. Each element is unique and may seem unrelated at its inception. It is when all of those elements come together, that a complete image of beauty is realized that was unexpected in the beginning." - Gina Dill-Thebeau Dill-Thebeau Design Company is a full-service residential interior design firm with 12 years experience of effortlessly balancing beauty and function while exceeding expectations. Founded by interior designer Gina Dill-Thebeau, DTDC specializes in luxury furnishings and fabric selections, space planning, kitchen and bath design and project management. DTDC projects range from re-designing one room to complete new builds from plan to fruition. Gina appreciates all styles of design but knows that the most important part of a great home design is the people who live there. Gina believes that your home should tell your story. Gina's approach to interior design starts with getting to know you. What makes you tick? What are your style preferences - do you like contemporary, traditional, eclectic, modern, or something else altogether? What kind of lifestyle do you live - are you busy and on the go or enjoying retirement? What do you want your home to say about you? Using this information, Gina will help you design a unique living space that reflects your personality and tastes. Gina brings to the firm nearly 15 years experience designing exceptional and luxurious living environments at St. Louis' premiere interior design firm, working on a wide array of projects, styles, and budgets. Her designs effortlessly balance beauty and functionality. 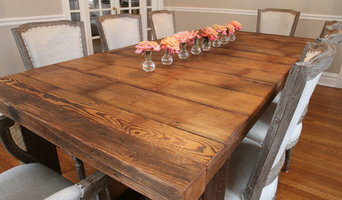 Rustic Grain is a St Louis, Missouri based furniture company that handcrafts home and commercial furnishings from century-old, reclaimed, mid-western barn wood. Our carpenters take great care to acknowledge the wood’s individual history and to preserve its character. Every piece has a story to tell and we tell it. The Finishing Touch Home & Office Interiors, LLC was established as a partnership in 1979 by licensed designer Carrie Babington. As their business expanded, they moved to the Edwardsville, IL and added designer Mary Droste to the firm. A beautiful Victorian home was purchased in 1997 and converted into their current office; with a gorgeous retail store located on the first floor and an expansive resource library on the second floor. Early 2015, brought changes to The Finishing Touch when Carrie Babington took sole proprietorship of the firm and later added Gina Krebs, design assistant and library director, and Maren Hampton, design assistant and social media director. In addition to the many years of experience and formal training, the designers pride themselves on staying abreast of new products, styles, and trends in the ever changing world of design. The Finishing Touch prides itself on being a seasoned firm with fresh ideas. Making ugly furniture pretty. I find old pieces of furniture and re-purpose them into beautiful pieces to add to your home. Unfortunately, I am not accepting custom orders at this time. Mueller Furniture in Belleville, IL features a great selection of living room, bedroom, dining room, home office, entertainment, accent, furniture, and mattresses, and can help you with your home design and decorating. For a wide variety of Amish Furniture near Belleville, IL, Mueller Furniture is your premier furniture store. View recent additions to our online furniture gallery. Mueller Furniture offers great quality furniture, at a low price to the St. Louis, MO, Belleville, O'Fallon, IL, St. Clair County, St. Louis County, South County, MO, Metro-east area, Fairview Heights, Shiloh, Collinsville, Edwardsville, Monroe County, Granite City, Columbia, Madison County, Glen Carbon, Illinois and St. Charles, Mehlville, Oakville, Downtown St. Louis, Brentwood, Afton, Webster Groves, Soulard area, West County, Florissant, South County, Crestwood, Missouri. area. Information Accuracy - We have taken great care to provide you with information that is accurate and useful. Please notify us if you find an error, and we will do our best to correct it. We ask that you contact us directly and visit our stores to confirm information about pricing, color, features, dimensions, availability and special order lead times. CENTRO began in 1988 as a trade showroom that represented furniture and lighting manufacturers from around the globe. A decade later, with a proven track-record of sales and service to the architectural and design community in the region, CENTRO opened its doors to retail clientele and curious, design-loving visitors. Today, CENTRO is the exclusive St. Louis retailer of the full collections produced by B&B Italia, Flexform, Tobias Grau, Kasthall, Dornbracht, Moroso, Ingo Maurer, Cassina, Cappellini, Driade, Fritz Hansen, Flos, Zanotta, Poltrona Frau, and more than a score of other furniture and lighting manufacturers. If you love a piece, you can find a way to make it work in your space. If you can't visualize where it would fit best, we have the resources to help you. We know a purchase like this is not taken lightly, even if it is a lot of fun. We buy from the manufacturers around the world that have spent years and money to develop the finest furniture and accessories... by designers known for their technique, their attention to minute detail, and their creative expression. We create one-of-a-kind functional and sustainable works of art. VFB offers design, construction, restoration and repurposing of quality wood furniture and accessories. I have been building handmade high quality furniture for over 30 years, but have turned my experience into a full time position within that last 2 years. I build my own design pieces that are available for sale, as well as working closely with designers and end users to build consignment pieces. My designs are simple and strive to bring out the beauty of the wood I use, making it the focal point. I want my furniture to be enjoyed for many lifetimes, and never end up in a landfill. In addition to construction VFB offers restoration services and re-purposing of existing furniture. I hand select or cut my own lumber and make use of traditional features such as re-sawing and book matching lumber, hand cutting dovetails, and using pegged motise and tenon joinery. My design services include very strong organizational skills with excellent follow thru along with a strong sense of color. I provide my clients with their wants and needs in combination with great style and design. Most importantly I want them to be happy because it is their home, not mine. And staying within budget is a very important goal of mine. David Stine Woodworking specializes in custom furniture handcrafted from sustainably harvested American hardwoods. Our work is offered to the trade and the general public. Start your research right here on Houzz. Read through professionals’ profile pages to find out important details, like how long a manufacturer has been in business. Look at reviews by design professionals and find out which furniture makers offer the best customer service. Are you looking for condo-size furnishings or working with an oddly shaped room? Necessity is the mother of invention, so opt for a custom piece made by an experienced Missouri furniture maker. Here are some related professionals and vendors to complement the work of furniture & accessories: Interior Designers & Decorators, Artists & Artisans, Kids & Nursery, Closet Designers and Professional Organizers, Bedding & Bath. Take your time on any buying decisions. If contemporary is your style, don’t buy something traditional because it’s on sale. Many Missouri home furnishers offer interior design consultations or room planning guides to get you started. Whether you decide to work with a home decor specialist or to become your own expert, it’s important not to rush the furniture-buying process. Visit plenty of Town And Country, MO showrooms and stores so you can feel comfortable with your purchase. Find furniture and accessories manufacturers, showrooms and retailers on Houzz. Narrow your search in the Professionals section of the website to Town And Country, MO furniture and accessories, then choose the nearest metro area for showrooms and retailers. Or you may want to look through Missouri photos to find designs you like and contact the furniture manufacturers and showroom galleries directly.